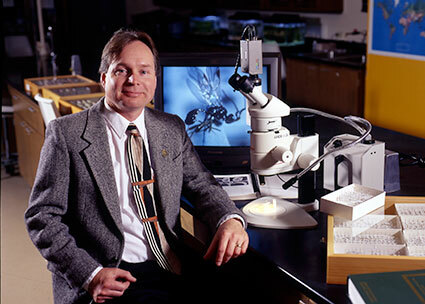 Shaw has received national and international recognition for his research on wasp species, notes Bret Hess, interim dean in the college. “Scott was selected because he has made a significant impact on his discipline,” says Hess. His book “Planet of the Bugs: Evolution and the Rise of Insects,” published in 2014, tells the story of the dominant insect species and how they shaped life on earth. The work has been translated into Korean, Japanese and Chinese, and an Arabic version is being prepared. Shaw received his undergraduate degree from Michigan State University and his master’s and doctorate at the University of Maryland College Park. He was curatorial associate of entomology at Harvard, managing the vast insect collection at Harvard’s Museum of Comparative Zoology for five years prior to joining UW. In 2009, Shaw supported and testified before a Wyoming legislative committee to designate the Sheridan's green hairstreak (Callophrys sheridanii) as the state butterfly. Selecting a state butterfly was the idea of third-grade students at Big Horn Elementary School in Sheridan County. Shaw’s distinguished career might not have happened without Dr. Seuss. Shaw related in earlier interviews that events in “The Cat in the Hat” and the 1960s science rush conspired to eventually land him in entomology and scientific research. Thing One and Two in the story motivated Shaw to get his first net, and he has been netting insects since he was 4 years old. The space rush of the 1960s had him dreaming of becoming a space shuttle astronaut. He claimed astrophysics as an initial major as an undergraduate, but that quickly changed. He even dabbled in poetry until deciding on entomology for his life’s work.